Accent, in decorating sense, emphasises or highlights something. 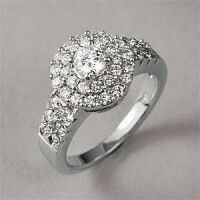 Diamond accent is very small cut round diamonds used around a larger diamond/gemstone or it surrounds a ring band. It basically fascinates the jewelry and helps capture the light. The precious and rare, diamond accents usually go by the solitaire rings preferred for engagement or weddings. Dazzle your special day with living out loud with the dramatic solitaire diamond accent rings. If you want to express the timeless love in your engagement or wedding day, why not a solitaire accent diamond rings or solitaire engagement rings ? A statement of eternity and elegance, diamond solitaire rings with accent are the Ã¢€Ëœsparkling factorÃ¢€â„¢ that come in different styles and shapes. A micro pave, split shanks or a halo diamond accent rings could be the impressive one you can wow your lover on the stop. What is a Micro Pavé or halo cut or split shank diamond accents? Micro means small and Pavé means paved with stones, so micro pave refers to the style of jewellery where multitudes of small stones are set into the jewelry. The diamond used here range from less than mm to slightly larger and sizes vary from 0.005ct to 0.01ct. A halo cut emphasises the central diamond with many simple stones bordering the bands of different shapes including oval, round and rectangular. 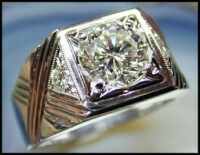 As a popular style, people look for gorgeous engagement or weddings rings. Enhancing the overall look design of the solitaire diamond centrally situated, this design is called as shank and when this shank is separated into two sections, it is called as split shank. Solitaire, the rare one promises to store the evergreen love union between you and your sweetie. For the enhanced look that you want to get, you have come at the right place. Queen Jewels present you a combination of rare colour diamond and white diamonds in different cuts, carats, colour and clarity. Our range of Queen JewelsÃ¢€â„¢ selection of diamond promise rings, solitaire engagement rings solitaire accent diamond rings , and solitaire wedding rings. Buying engagement rings online with the diamond accents at Queen Jewels, for all men and women, fancy up your special day with spectacular and sparkling diamond accent rings or diamond solitaire engagement rings. You can play with your special outfit with the affordable solitaire engagement rings that is available at various colour and cut. With a good grade materials, our fancy colour diamond accented rings range from deep orange brown to grayish greenish yellow to grayish yellow. Our ring gallery has the contemporary and splendid micro pave, halo, split shank and twisted split shank accent rings are embellished with outstandingly cut diamond in different cuts including radiant cut, cushion cut, pear cut and round cut all set in either white gold or yellow gold. Shed out the tension of the budgeting problem as we are one of the top online shopping sites who understand the value of your diamond search and thus offer you diamond at quality and guaranteed wholesale price. Also we give free shipping of any selected rings you have chosen. 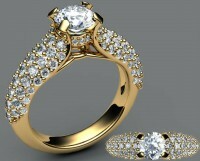 At Queen jewels inc diamond exchange, we promise you full diamond accent rings & solitaire engagement rings range.